Random Anny .Com: WTF VW!? 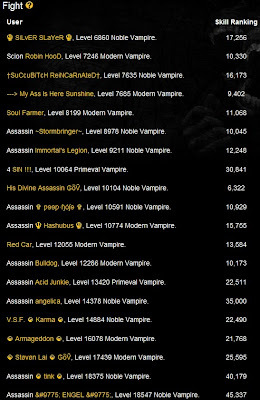 So I got addicted to that Vampire Wars game on Facebook last week and just now made it to level 126. Up until level 126 you're matched against similarly skilled fighters but once you get to 126 all coding bets are off. Make sure you click on the picture to see the larger view with how ridiculous these stats really are. How did you made this Oo? becoming such a high lvl in such a short time?